Now I'm all for getting into the Halloween spirit and going all out with your makeup, but chances are you're unlikely to wear that black lipstick you picked up anytime soon. Today I thought I'd share some Halloween appropriate lipsticks you can wear again and again. If you can't wear a classic red during Halloween then when can you wear one? My red lipstick choice has to be the Max Factor Colour Elixir Lipstick in Ruby Tuesday. This would work for all sorts of costumes like some old Hollywood stars or a demon sort of look. I chose this one because it has a slight pink tone so it's not quite as dramatic as your typical red and the finish is sort of in the middle between glossy and matte so it's very comfortable to wear for a night of trick or treating. Or Halloween parties, lets be honest! If your costume is a little bit more on the girly side, the Bourjois Rouge Edition Velvet Lipstick in Frambourjoise is perfect. As good as bright, barbie pinks are.. they're just not very practical for regular everyday wear so this is the perfect alternative. 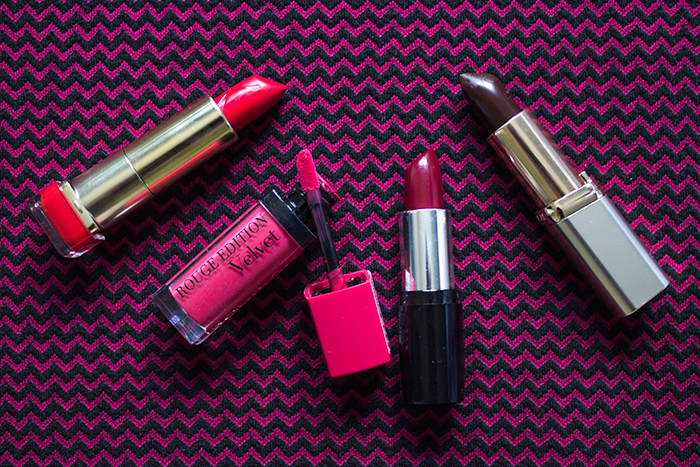 The colour is a very rich, deep pink and a velvety/matte finish. If you're looking for something long lasting and bold, this is the one. 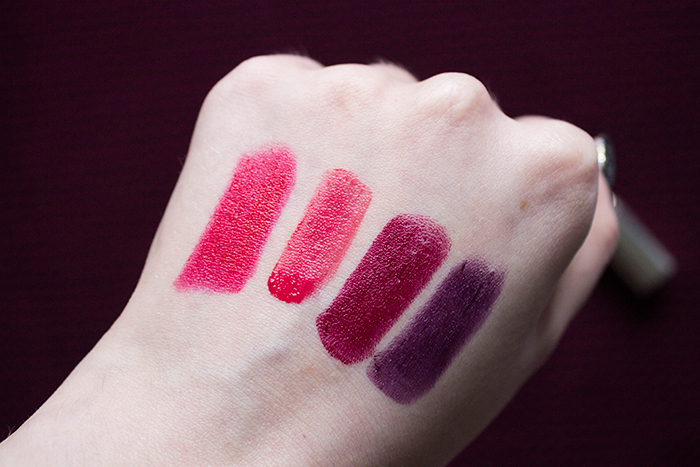 When Autumn is around, the berry lipsticks are all the rage so you'll get a ton of use out of them during the next few months. My choice would be the Collection Lasting Colour Lipstick in Aubergine Kiss, it's a gorgeous berry/wine colour with a glossy finish and at £2.99, it's very affordable, especially if you think you won't get as much use out of the colour in the future. This would be great for any sort of vampire or gothic looks you have going on for Halloween. Last the most daring shade of all, purple. I found that the L'oreal Colour Riche Lipstick in Préliminaire was the best choice for this shade as it has a sort of glossy/sheer finish which makes it easy to apply. I also find with this sort of formula that you can control the opacity of the lipstick by dabbing it on or applying it straight from the bullet so you don't have to go all the way. This is the perfect shade for a witches costume or generally anything scary related. That is my Halloween lipstick picks! I do find that Halloween can be pretty expensive sometimes so for any makeup that you do have to buy, I think you should be able to wear it again to get your money's worth, especially if you're going for good quality products. I hope you all have a wonderful Halloween!